Trees roots need a regular supply of food and water if they want to flourish. Problems will occur if a tree discovers its next meal or drink is hidden in your sewer pipes. Roots can damage sewer and storm water pipes, obstruct the flow and eventually cause blockages. Root damage can also let storm water into pipes. During heavy downpours this extra water can overload the sewerage system causing it to overflow into creeks and rivers and the environment. If the problem occurs in your private sewer pipes, it is the home owners responsibility to have it repaired. 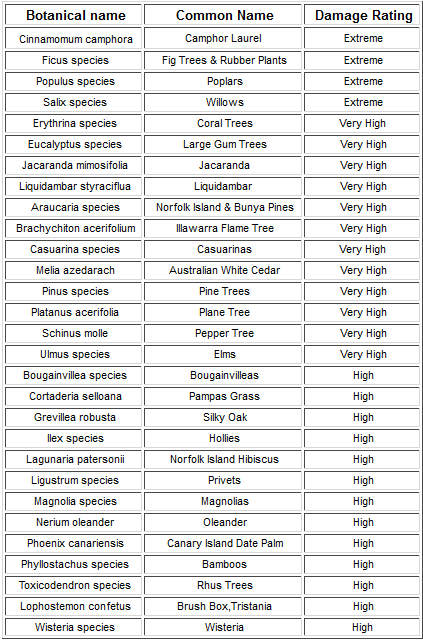 Some problem species are listed below. It would be wise avoid planting these. Damage to underground sewer pipes can be reduced by avoiding tree and plant species that are likely to cause problems, and planting trees as far away from pipes as is possible. Before planting a tree, first find out where the sewer pipes are located on your property so that you can stay well away from them. Most home owners have a plan or can get a plan of their property which shows the location of sewer pipes and other plumbing. Dial before you Dig is one resource available to give some idea of underground services. Next, consult a nursery or gardening guide to find out how far the plant’s roots will travel and whether the particular species you are interested in has invasive roots. They will usually extend about one and a half times the distance of the adult plant’s branches. If roots have blocked and damaged your private sewer pipes you will need to get a licensed plumber to clear them. 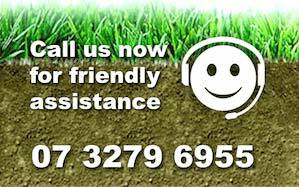 As well as removing the roots you should consider fixing the damage in a way that will minimise future problems. If you stop roots re-entering your pipes you will save yourself the expense of having to keep clearing and maintaining them. You will also be going a long way in protecting the environment by keeping storm water out of the sewer. If you want to rectify the problem ask your plumber to estimate where the blockage is located. Your plumber can then dig to remove the roots and repair the pipe to stop the tree or plant roots from entering the pipe work again. In extreme cases it may be necessary to replace or relocate the pipe. Your plumber can recommend the best solution for your particular problem. 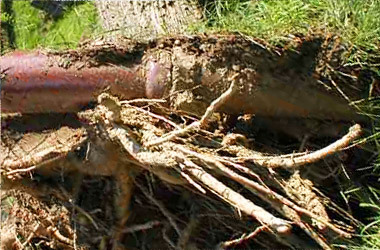 70– 80% of sewage overflows are caused by tree roots. Tree and plant roots extend about one and a half times the distance of the branches. Keeping plant roots out of your sewer pipes; Beware the hidden intruder! Remember: if your pipes are old and cracked, the roots of almost any tree or shrub will find their way in. Where possible, do not plant trees or shrubs anywhere near your sewer pipes.